This page consists of many useful books of Strength Of Material subject. These books are very useful for both students as well as teachers. These are very easy to understand and contain lots of Numerical Problems both solved and unsolved. So the readers can take the maximum advantage and can build strong command in Engineering Mechanics as well as Strength of Materials. 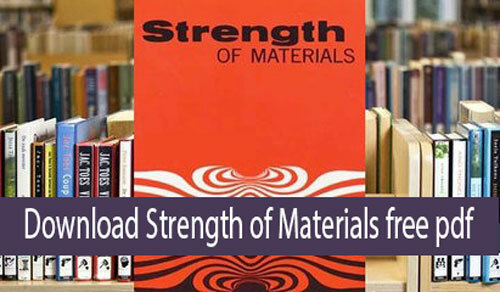 You can download free Strength of Materials Books pdf here. Strength of materials is a basic engineering subject along with statics. This subject must be understood by anyone concerned with the strength and physical performance of structures, whether those structures are man-made or natural. The Strength of materials subject is useful of the students who are pursuing petroleum, aeronautical, mechanical, structural, and civil, Biomedical Engineering, and Aerospace engineering. These books are very useful materials for the candidates who want to get a depth knowledge in Strength of Materials subject and for the best preparation also. Book mark this page to get more engineering branches books for free.